Following the ECB’s meeting yesterday the euro gave back its initial gains, while precious metals pulled back strongly from their intraday rally. However, price action across the board still looks a bit volatile, but there is a possibility that the US dollar could see some upside in the near term. EURUSD (1.12): EURUSD formed an outside bar doji following the bearish close the previous day. Prices remain close to the 1.130 handle so the bias remains flat as prices could still attempt to break higher. The 4-hour chart shows prices trading within a consolidating triangle which could eventually open up a strong momentum led a breakout. $1.140 is the resistance to watch on the upside while $1.120 will be the support to watch to the downside. Plotting the median line, we expect to see the downside momentum prevail but only on a close below the lows at 1.123 – 1.125. USDJPY (109.9): USDJPY closed bearish yesterday and formed an inside bar following three days of gains and could potentially spell a pullback in the near term unless prices close strongly higher today. The breakout from the minor median line and with prices trading outside the median line indicates further upside to prevail towards 110.14 – 110.67. 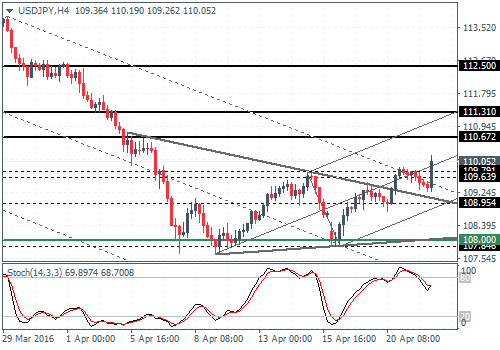 For further gains, USDJPY needs to close above the current support/resistance region near 109.8 – 109.64. For the moment, the 4-hour chart shows a bullish breakout from the consolidating triangle, but resistance is seen near 110.220 – 110 which could push prices lower in the near term. 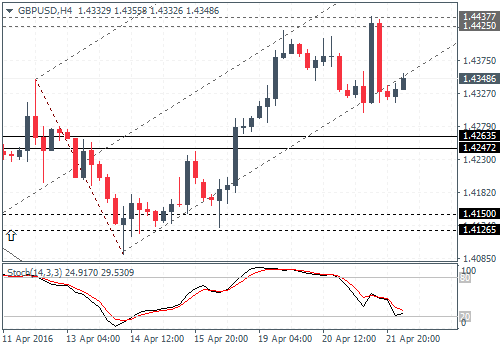 GBPUSD (1.43): GBPUSD price action was similar to that of the EURUSD with price action forming an outside bar doji, just below the 1.4425 resistance. Price action could remain ranging unless the resistance level is broken. On the 4-hour chart, GBPUSD posted a strong decline after a test to 1.443 – 1.4425 resistance but is currently trading near the lower median line. 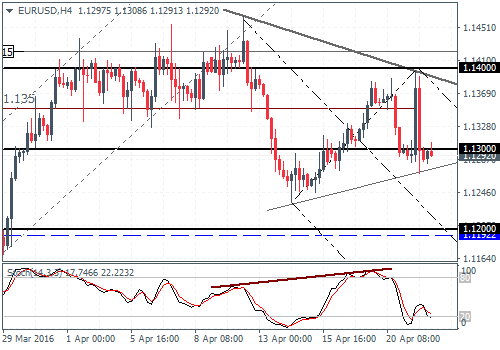 Unless prices move higher and break above 1.4425, GBPUSD could fall back and test the support at 1.4263 – 1.4247. 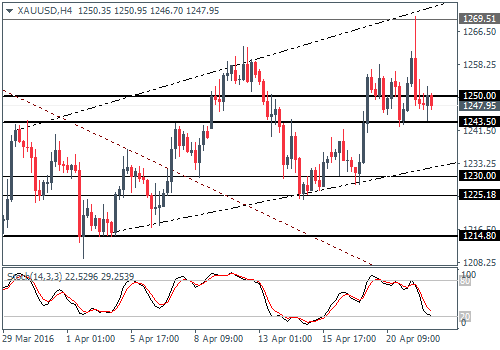 XAUUSD (1248): Gold prices were volatile yesterday, but prices managed to pull back towards the end of the day. Failure to close above the most recent doji high at 1262.68 indicates a move lower. 1231.5 support will be key to watch initially; a break below could see a move to 1200. On the 4-hour chart, gold is seen trading in the 1250 – 1243 support level below which comes the previously tested support at 1230 – 1225 as gold trades within a broadening wedge pattern.